Unfortunately this morning I was going to melt the butter and sugar on some cinnamon flat bread in the Advantium and the control panel was completely blank. Dave had done some roasting in it just yesterday and didn’t notice it malfunction. The first thing we checked was the circuit breaker and reset it but it did not restore power to the oven. Oh no, what now. Dave mentioned that it might have a fuse so looked up fuses in Advantium ovens and it does have one on the relay board. So we began to take off the control panel to get to it but it was VERY difficult. The screws for the panel cover are located on top but also on the bottom under the grille. But the grille is also screwed on its top underneath! So we had to unclasp the grille, breaking one from the bottom of course and then reach a screwdriver up under the grille to remove the control panel screws, then lift and tug the panel off and then unscrew the grille. Next was removing the touch panel and the panel behind that. 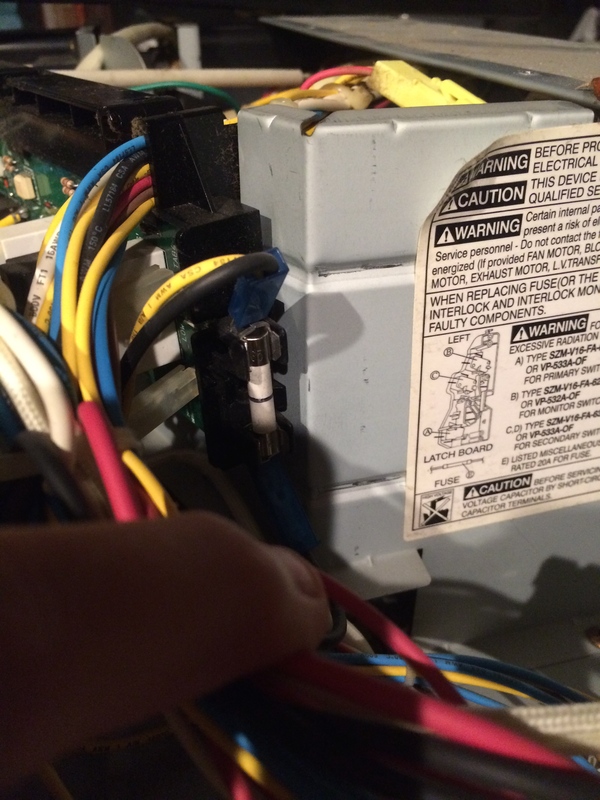 Which left access to the fuse on the relay board. 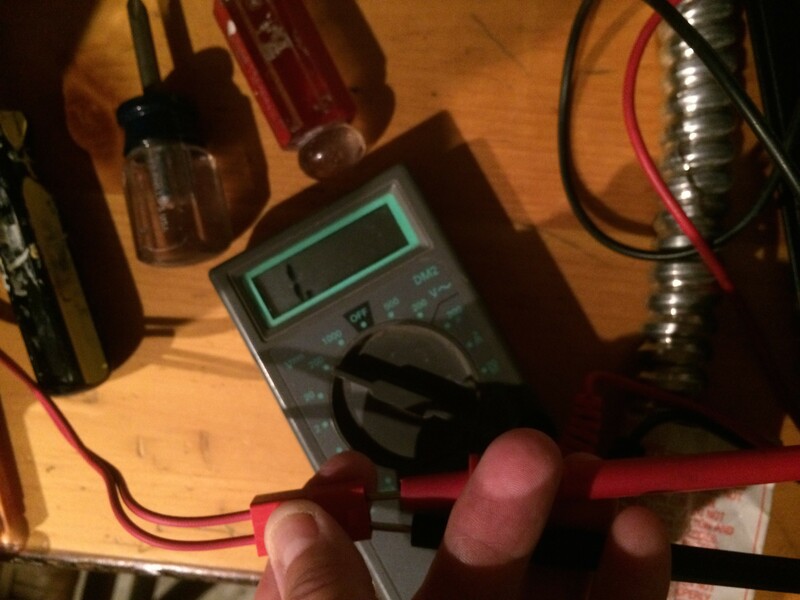 But when checked for ohm reading with the multimeter, it looked like the fuse was fine! Then we had to remove the entire oven from the cabinet and take off the top and right side access panels. I took off the left too just to get a better look at that side. The oven has four TCO–or thermal cutoffs. They are for the top halogen, the bottom halogen, the oven cavity and the magnatron. The only one that can reset itself is the magnatron. The others must be replaced if they trip. The oven cavity will trip on an overheat condition. Generally there is a fault code on the panel for this, but it can also keep the oven from powering at all. The gem found on the internet was the Advantium Technical Service Manual. Some manual sites require a membership to download a manual but this one does not. It is so much easier to search the document if you have the full pdf. I was looking for the fuse/TCO information. 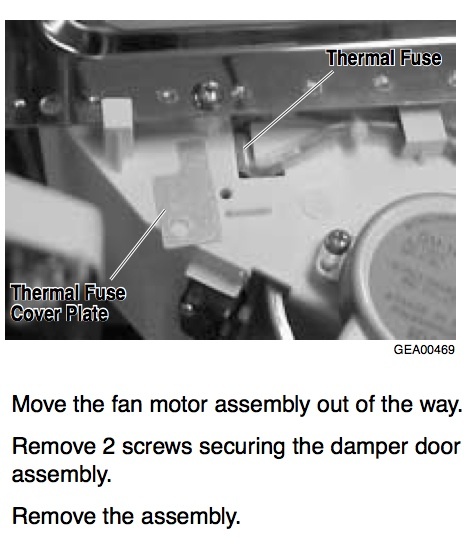 I found the dis-assembly instructions to get to the cavity thermal cutoff on P. 32. This is how these instructions resulted on our oven. The “fuse” is a component connected at the end of the two red wires. I ordered a new fuse assembly Part Number WB27X10335. I found it at Parts Select as well as on eBay and Sears Parts Outlet. eBay was cheapest but I wanted fast shipping so I used Parts Select. The total with 2-3 day shipping was the same as the part at Sears–$28 and change. I hope it will get here quickly. I am not sure if this part tests the same as a fuse with an ohm reading. But it did seem to be “bad” using the multimeter. One post suggested jumping the TCO and applying power to see if the oven showed power without it. But since the oven was disconnected applying 240 volts was going to be difficult so I just ordered a new part. Hopefully this is the problem. Apliantology had a discussion about removing and replacing the fuse–but on a different model that seemed much easier to disassemble. I signed up for this site to see the photos but it required an expensive subscription. But the print explanation tells why the cavity TCO could be the issue. The Thermal Cutout Fuse is heated by air exhausted from the cooking chamber of the oven. If there is a food fire or other other overheat condition, this fuse is supposed to temporarily open, Thereby bringing all operation of the oven to a DEAD STOP. Emphasis on the DEAD, i.e. electrically dead. Problem is, these little fuses are poorly designed/constructed such that they will remain open when they are supposed to close as the oven cools off. Actually the TCO’s are considered single use–but the explanation of an overheat condition in the technical manual says the oven should show an error code. Obviously it can’t if a bad fuse makes the electricity be totally turned off. We’ll see if this is the part that is needed. If not there are two more near the halogen lamps. These lamps are very expensive so hope I don’t have to get into the compartments to find the TCO’s or have to change the lamps. 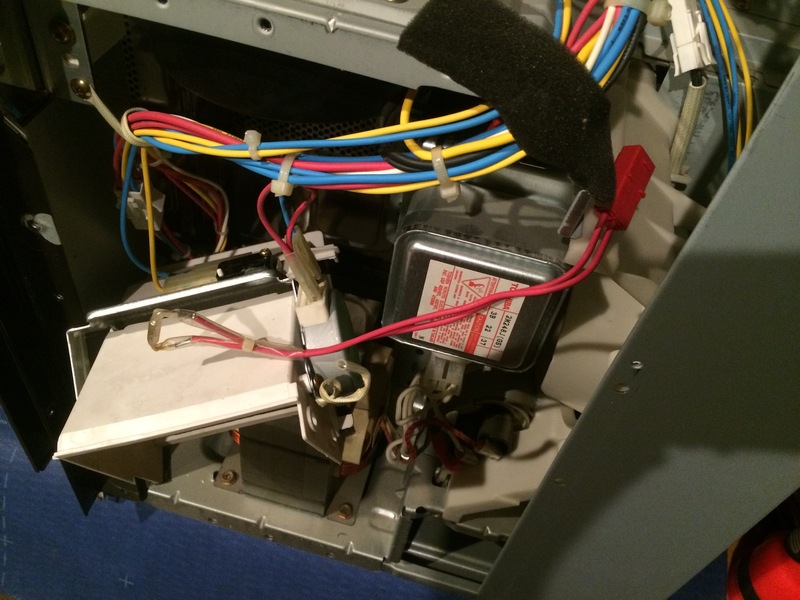 This entry was posted in Appliances, Maintenance and Repair. Bookmark the permalink.